Jewelry Photography with an iPhone! For several years I’ve used my Canon 40D on a tripod to photograph my jewelry. Recently I’ve been getting lazy and sometimes use the camera in my pocket, my iPhone 4s! Here’s my latest necklace and the photos which I’ve used in my online shops. Have to confess I’m thrilled with the way this necklace turned out. 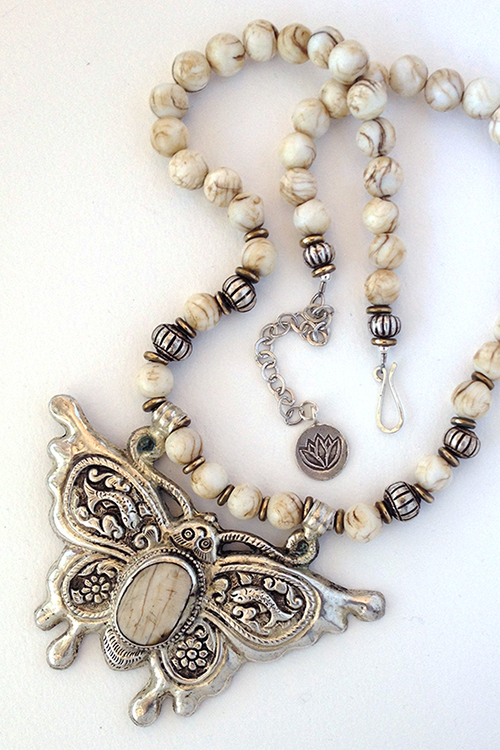 Loved the design challenge of how to show this gorgeous Tibetan Butterfly pendant off to it’s best. Actually, before I was out of the gem show where I found the pendant, I knew I had to find a shell mala with beads to harmonize with the beautiful old shell cabochon at the center of the butterfly. Turns out that shell malas are getting a bit rare but I did find one. Unfortunately the one I found had been stained and covered with a very shinny clear coat. I wanted natural shell – which happily got solved by putting the beads in a tumbler with sand for a few hours. You can see the necklace description and all the photos I used for it at my online Zibbet shop here. Further confessions. I still think the jewelry photos I’ve taken with the Canon 40D are better but, hey the Apple 4S works! Take a look around my Zibbet shop and see what you think – the Tibetan Butterfly has the only photographs I did with the iPhone. For another comparison, on my website, www.annbrooks.net, all photos were taken with the 40D or one of the Canon Digital Rebel series.